Four young Brothers from the Lasallian Region of North America (RELAN) will enter the Regional novitiate in Napa, CA, this summer. 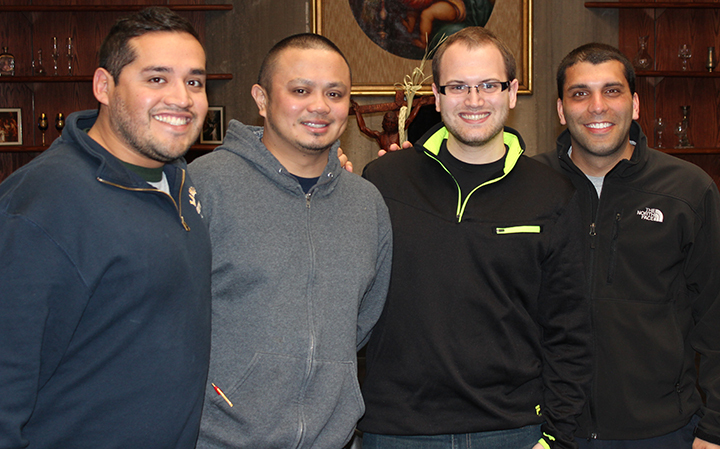 Brothers David Deradoorian (DENA), Anthony Elfering (Midwest), Patrick Martin (San Francisco), and Roberto Martinez (San Francisco) will begin the one-year program August 12, 2013. 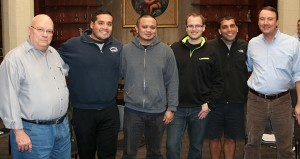 (L-R) Brothers Philip Johnson, Roberto Martinez, Patrick Martin, Anthony Elfering, and David Deradoorian, and Kevin Slate at the April 2013 Young Brothers Gathering. During their time in the Novitiate, the novices will take part in classes and activities to develop their faith, their understanding of religious life and the Brothers, and their experience of community. The novitiate program is under the leadership of Director Brother Kevin Slate and Sub-Director Brother Philip Johnson. Bro. Kevin, a member of the San Francisco District, served as Director to the 2010-2011 novitiate class. Bro. Philip, a member of the Midwest District, is currently Coordinator of Ministry/Identity at Lewis University. Please remember in your prayers these four young men committing themselves to live as De La Salle Christian Brothers.